A successful presentation demands that people sit up and take notice. Yet, when was the last time you found yourself drifting off during a monotonous slideshow? It’s probably not that long ago. It never fails to amaze me how often smart people continue to make the same mistakes and give bad presentations. These seven steps will save that big presentation from becoming naptime for the audience. A slideshow is not a teleprompt. This is the first mistake I see far too many speakers make. Take the time to practice in front of friends or close colleagues that won’t be afraid to advise you after. It’s always obvious to everyone in the room if you’re repeating someone else’s words. If you are not passionate about the subject, you can’t expect anyone else to be. This one’s another big pitfall. Who are you presenting to and what is their knowledge of the subject? Doing the homework on your audience is as important as content. Engaging the floor is much easier if you know what makes them tick. It’s human nature to tell stories. Our ancestors have framed information with narrative long before water coolers and office gossip. Structure your presentation as a beginning, middle and an end. Include characters and obstacles that the audience can relate to. Suddenly a dreary conference centre or boardroom becomes much more entertaining. Summarising a research project is always going to require a different approach to pitching a PR strategy. However, presenting technically complex information is no excuse to roll out biblical proportions of text. Twenty or more slides plastered with numbers will immediately turn any audience off. Use the TED Talk model as inspiration. Many of the presenters don’t even use slides but when they do, they covey their message with the bare minimum of visual content. 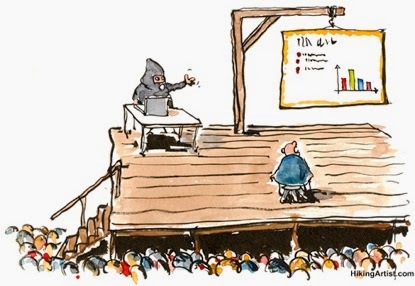 If presenting to a smaller group, then a whiteboard or flipchart might be more suitable. Slides should complement what you are saying, not the other way round. By all means include text in simple bullet lists but remember, facts and words are more captivating when you verbalise them. Let vivid imagery tell the story that you cannot. Use eye catching pictures to best convey complex information. Infographics are great for this. If you are going to use photos, then make sure they are inspiring. You don’t have to become a stand-up comedian… but it helps. A lighthearted remark or humorous context will relax the audience and make them more receptive. Have you noticed how the majority of comedians begin their gigs chatting with the crowd? It involves the audience and identifies situations that everybody can relate to. I’ve noticed a growing trend for audience participation at conferences that gets the audience out of their seats. Make your presentation more memorable by revamping the tired Q&A formula and invite feedback throughout. Blog by Richard Delahay, Junior Consultant at Brussels-based sustainability communications and PR agency Sustainability Consult. How Does Climate Change Affect Jobs?